I really had fun with this one and I think it's closest to being the best BBQ Beef Burger recipe that I've made for the grill in very a long time. 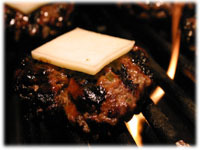 It's made with 100% medium ground beef to get just the right fat content to keep the burger moist. 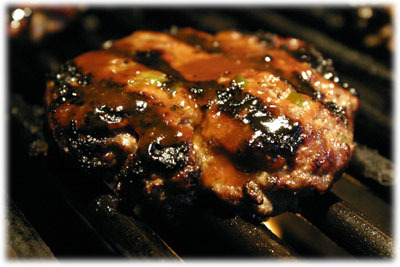 Add some diced jalapeno peppers and your favorite smoky barbecue sauce and barbecue seasoning and they're ready for the grill. 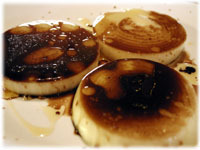 Drizzle thick slices of Spanish onion with oil and balsamic vinegar, let them soak a bit, then cook them on the grill beside the burgers. Top the burgers with Monterey Jack cheese when they're on the grill then smother them with the grilled onions when they come off. These burgers are best served on toasted English muffins that have been brushed with melted garlic butter before putting them on the grill to toast. Try them and let me know what you think in the comments section below. Caution: when handling peppers always wash your hands when done to avoid transferring the oils to your eyes (or worse!). 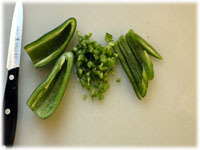 Slice the two jalapeno's in half and remove the core and seeds. Rince the peppers under water, slice into thin strips and then dice into small pieces. 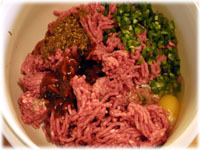 In a large bowl combine the diced jalapeno, ground beef, 1/4 cup of the BBQ sauce, BBQ seasoning and 1 raw egg. 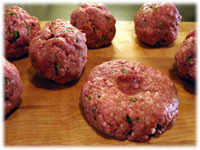 Form 6 equal sized balls of the burger meat mixture. Gently form each ball into a patty a little larger than the english muffins. Don't overwork the meat as this has a tendancy to make a tougher burger. 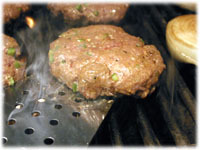 Make a small indent in the center of each burger patty to accomodate swelling when on the grill. Cut the spanish onion into 3 slices, each about 1/2" thick. 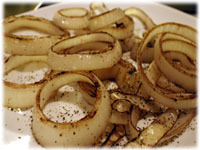 Keep the onion slices intact (don't separate the rings). 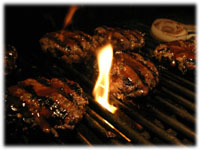 Drizzle olive oil and balsamic vinegar over both sides, cover and let rest for 30 minutes (while the burgers rest in the refrigerator). 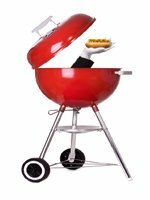 Preheat the grill to 425F - 450F and oil the grates. 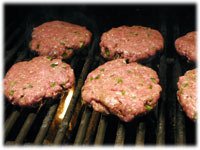 Rub a little oil and salt on each side the bbq beef burgers and place them indent side down on the grill. Carefully place the oil/balsamic spanish onions on the grill. 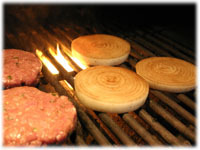 After 5 minutes on the grill carefully flip each burger over. Spread the reserved 1/4 cup of BBQ sauce on the top of each burger. Very carefully turn each onion over making sure none fall through the grates. They should be getting tender and browing up. Place a slice of Monterey Jack cheese on the top of each burger and close the lid. 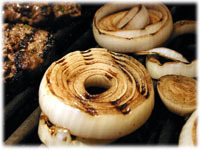 After 5 minutes remove the grilled onions to a plate and separate them into individual rings. Sprinkle with salt and pepper and cover. Check the internal temperature of a burger with an instant read thermometer, for this recipe it's best to remove them when they're 165F. Cover them and let them rest 5 minutes. While they rest, brush the cut side of the english muffins with the melted garlic butter and toast on the bbq. 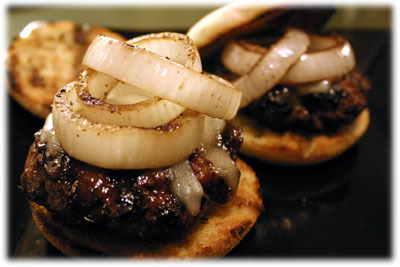 Place a bbq hamburger patty on a toasted english muffin and top with some of the grilled onions. Add any other of your favorite toppings.